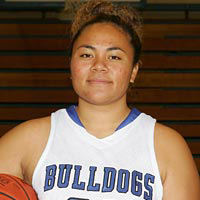 Ofa was a strong force for the bulldogs last season with a good shooting touch. She was the top free throw shooter with 83%. She is majoring in Architecture and dreams of designing houses and building a new stadium for the 49ers. In high school she earned the Most Improved Award and MVP award for track. She was also on the honor roll and the Polynesian Club. Her parents are Kitione and Wendy and her siblings are Ana (17) and Deion (16). Her hobbies include music and sports. She works at Sports Authority and is an official for many different sports. Her hopes this year include going to state play-offs, getting in shape, and improving her game.